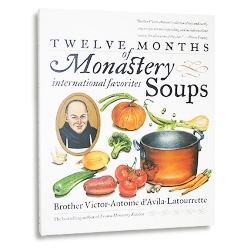 The author of Twelve Months of Monastery Soups and other bestselling cookbooks brings us this wonderful collection of graces based on the seasons. Includes readings from Scripture, liturgical texts, as well as monastic and mystical Christian writings. Also includes a separate monthly calendar of feasts and saints' memorials. 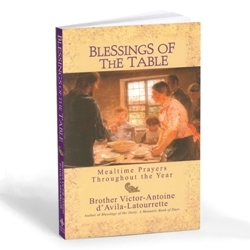 Groups, families and individuals will all find these readings and prayers a time-honored way to sanctify mealtime. Scripture-inspired woodcuts introduce each section. Paperback, 172 pages. 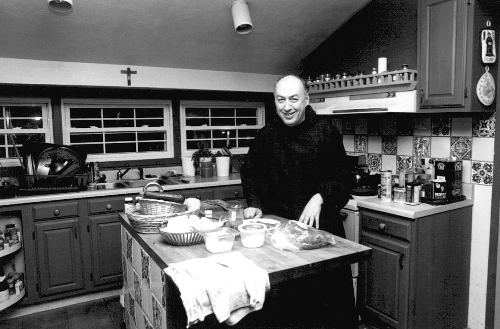 Brother Victor-Antoine d'Avila-Latourrette and other monks established Our Lady of the Resurrection Monastery in 1977. The community is a spiritual family whose life is based on the Gospel and the Rule of Saint Benedict, and is particularly inspired by the early monastic tradition received both from the East and the West. Ecumenical dialogue, especially with the Eastern Orthodox tradition, is of special interest to the monastery. Both Gregorian chant and Russian monastic chant are employed in the monastic offices. 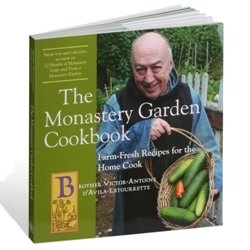 Brother Victor is the author of six cookbooks including the best-selling Twelve Months of Monastery Soups and From a Monastery Kitchen, and serves the monastery as cook and gardener, tending the two gardens and greenhouse that provide the produce and herbs for the monastery. The monastery is supported by sales of books and the consumable items made from organic ingredients grown there: dried herbs, herbal teas, pesto sauce, tapenade, chutney, jams, tomato sauce, apple sauce and apple butter, salsas, and relish. The monastery also sponsors a monastic land conservation program that attracts several students each year from the surrounding colleges and universities. Mar 18, 2017 | By Carol R.
Blessings of the Table; Simply Living the Beatitudes; Walk in His Ways; all great books by Brother Victor; I'm waiting for a Lenten book! Journey to Easter? Please write it soon!